Getting a tooth pulled is a big decision. The two main reasons why you might need to get a tooth pulled are either toothache, or to make some room for straightening crooked teeth with braces. A third possibility would be if you need to have a wisdom tooth removed. If you're thinking about having a tooth out because of toothache, remember that the tooth doesn't grow back, and you will be left with a gap afterwards. It is always possible to get a replacement tooth, such as a bridge or an implant, but these options are never as good as the real thing. Also, they will involve additional expense! You can read about this at dental implants cost. So don't make the decision about getting a tooth pulled quickly or lightly! If your dentist has told you that you need to get a tooth removed, you're probably wondering what's going to happen, what will it be like, and how sore will it be afterwards. wisdom tooth - where there's no room for it to grow properly. Click HERE for more information. 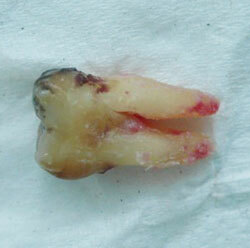 infected tooth - and you don't want root canal or the dentist has said it isn't possible. cracked or broken tooth - where the tooth is broken beyond repair. gum disease - you have a loose tooth. In these situations the only option is to get the tooth out. If the dentist needs to make some space to straighten your teeth with braces, and a tooth needs to be removed to make that space, the dentist will look to see if there is a tooth with a big filling or some other problem. If you only need to have a tooth out to make room for braces, it obviously makes sense to take out a weak or chipped tooth, rather than one that's completely healthy. The first thing is to get the tooth REALLY numb. We start off with a little blob of anesthetic gel on the gum next to the tooth. This should stay in place for 3 - 5 minutes, and will numb the gum before the shot. After the gel has been in place long enough, the dentist should slowly numb the tooth. You can read more about this at Dental anesthetics. Two important points about dental anesthesia are that: First, the injection should be given VERY slowly, over about 3 to 4 minutes, and then you should get at least one additional injection after the first one has started to work. Second, you need to wait a full 10 minutes after that for the anesthetic to really take effect. Once the tooth is numb, it's time to start. Unless the tooth is really loose, we can't just grab it and yank it out. We have to be a lot more careful than that! So, the best way to remove the tooth is to slowly and gently wiggle it from side to side. It's very similar to how you pulled out your own baby teeth, when you were a small child, and your baby teeth became loose. As the dentist slowly moves the tooth from side to side, you will feel quite a lot of pressure building up. In fact, the pressure on the tooth is what most people notice most. If the tooth is in your lower jaw, and you jaw joint starts to get tired, the dentist can give you a small rubber block to bite on. This lets your strongest jaw muscles work against the pressure, and hold your jaw joint in place so that it doesn't get tired. After a few minutes, the tooth will start to become loose. But still the dentist has to go slowly! He wants to avoid breaking any bits if possible. As the tooth becomes more loose, you will feel the pressure easing off. Finally, the dentist can gently lift the tooth out of its socket. Job done! At this stage, your jaw muscles will be feeling quite tired, and you will be glad to relax. The dentist should put a small piece of gauze over the socket in the gum, and get you to bite down gently to hold the gauze in place. These days, it's quite common for the dentist to put something in the socket to help with healing and bone growth afterwards, which can help if you plan to get a dental implant put in there in the future. These dressings stay in the socket, and dissolve or become integrated within the healing socket over a few days. After about 5 minutes or so, the gum should have settled enough for you to leave the office. It's best to take it easy for the rest of the day - no sport or exercise! General advice for the first 48 hours after getting a tooth pulled usually includes not smoking and not rinsing your mouth vigorously - only very gently bathing the area with hot salty water, but NOT swishing it around forcefully! 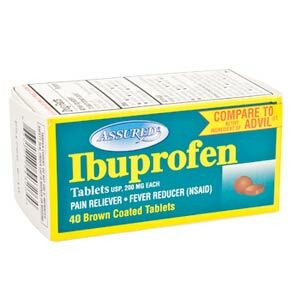 The best painkillers at this stage are probably ibuprofen (sold under the name Nurofen) or Paracetamol. You should avoid taking any aspirin at all, as this can stop the gum socket from clotting properly - Aspirin tends to slow down the normal blood clotting process. If you have any questions after getting a tooth pulled, telephone the dentist's office. It's always better to check and be sure!